← Darwin at Forsyth Resort. 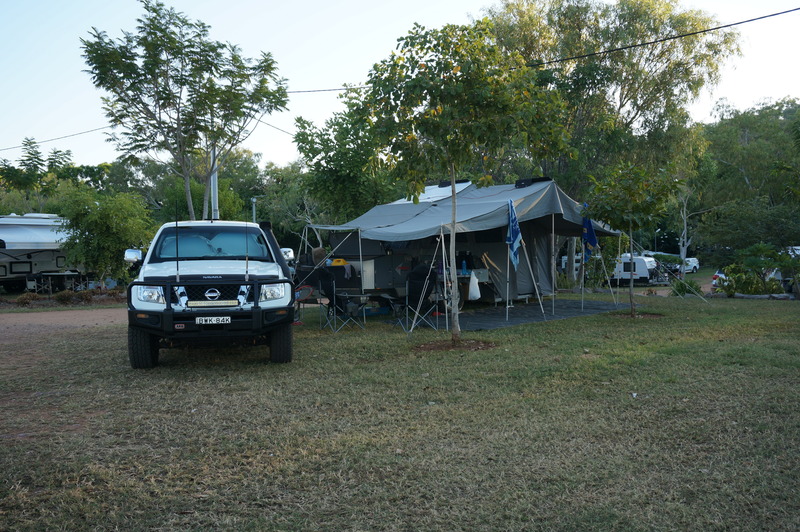 Sunday 28th May we left our free camp at Matheson and headed towards Lake Argyle for a three night stopover. It wasn’t to be a long drive so we took our time and enjoyed the ride. Victoria River was a beautiful area, the river itself was absolutely fabulous with clear blue skies above, the ranges of red behind it and an expanse of greenery along its banks, of course we had to get pictures. Lunch was early but at a lovely quiet spot off the road just inside the NT border, we had to eat our salad now or lose it at quarantine. 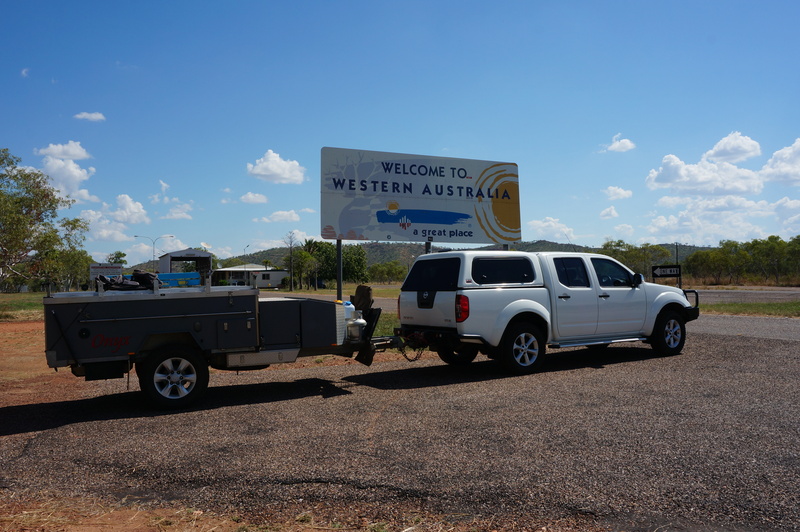 When we reached the NT/WA border I realised this was the third state we were entering and was a bit excited. As we drove along the landscape was becoming more rugged and the boabs lined either side of the highway, sharp ledges of cliffs jutted out along the horizon. This country….so many adjectives one can use to describe it. Thrilled to be travelling within it. Crossing another border. Our third. Lake Argyle arrived into our view. Wow! Staff at the resort were friendly and the whole place was a hive of activity with everyone coming in at once. They placed us up on a bit of a hill where we had a great view of the cliff faces, were pretty close to the infinity pool, the area where the helicopter took off and landed and our ammenities, which is always good. This place takes your breath away with its picturesque views of the lake lined by the rugged backdrop of the Carr Boyd Range. Happy hour couldn’t come quickly enough, so after a swim and shower we headed to the hilltop with the Lake in view where local boy Steve Case was going to entertain us for half an hour, with his own compositions. What a perfect way to end the afternoon with some easy listening tunes and an eye catching view. After dinner at our camp we headed to the beer garden to listen to some more music from Steve and got to not only enjoy him but also some dancing and singing by the audience. Ahhhh, love this life! Monday morning what a setting for my yoga, the hottest place but the prettiest. Another easy day with a few walks, swims, lots of talking to and meeting new people and catching up on things before we headed out for our sunset cruise which was going to be the best. What a view from the infinity pool. Josh was our guide for the afternoon. He picked us up in the bus at 2.15 taking us on a drive first to see the dam wall which held all this water in and the hydro power station that is powered by the water released from Lake Argyle for the Ord River irrigation system, then down to the Kimberley Durack cruise boat and our captain Stacey. There were fifty of us on the cruise and we were all abuzz with excitement. This Lake holds the equivalent of 17 Sydney Harbours and is home to over 30,000 fresh water crocodiles. Birdlife is abundant with black cormorants, pelicans, kites and many other species. When we reached the deepest section of the lake, around 89metres, we got to have our first quick swim and the water temperature was a lovely 26 so it certainly wasn’t cold. It was a lovely relief out on the cruise from the heat back on shore which had been 36 when we left. We cruised through crocodile cove and saw some freshies sunning themselves on the banks and witnessed a feeding frenzy from the catfish in another little bay when Josh threw some pellets in for them. The rock formations and colours were absolutley fantastic. Josh did a wonderful job throughout the afternoon of filling us in about the place. He’s a Kiwi but knows everything about the lake and surrounds, he even said that himself. Eventually he took one of us. Happy to be here. The wind came up a bit by the time it was sunset which made the water a little more choppy than usual but we still got in the water for our sunset swim with wine/beer and nibbles floated out to us on a life buoy while we bobbed up and down on noodles. Heading back into the harbour around 6.30 we discovered it was still hot on land. Everyone was once again busy with talk, we had all swapped stories through the afternoon as well. Lots of lovely people we have met on our journey. Tuesday morning we went for a walk to the lookout up the hill from the resort, what a view. Later we took a drive around the dam wall and picnic area below and visited the old homestead of the Durack family who were early pioneers of this area. Back to the Lake for a swim in the infinity pool, which we loved, and dinner in the beer garden, fresh local fish for me and roast pork for Murray. Once again we listened to the music of Steve Case while we enjoyed a beer/wine with our new friend Gary. Wednesday we will head off to Kununurra for two nights after which we will be hitting the Gibb River Road starting with four nights at El Questro. The Gibb is all dirt with lots of gorges, waterfalls and special places to visit. Even though the road is only around 660kms we will be spending a couple of weeks checking out a lot of what is there. As reception is not something we will have while on this road you won’t hear from us till after 20th June when I will bombard you all with what we have been up to in that time. 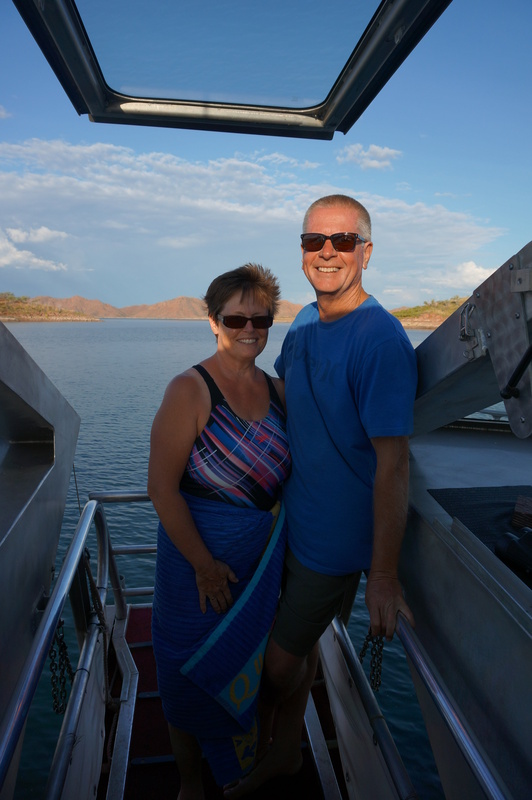 This entry was posted in Adventure, everything, Life, Love and Laughter., Travel and tagged Lake Argyle, Steve Case, Western Australia. Bookmark the permalink. 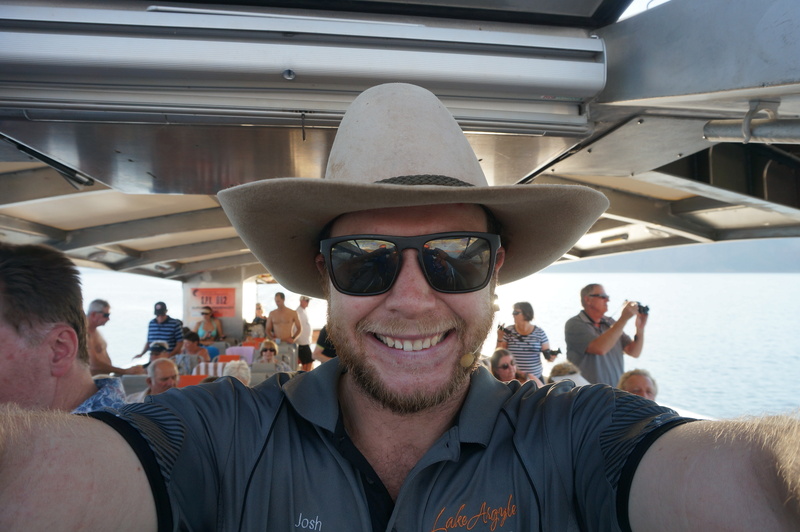 4 Responses to Lake Argyle. Oh boy! What a great post! 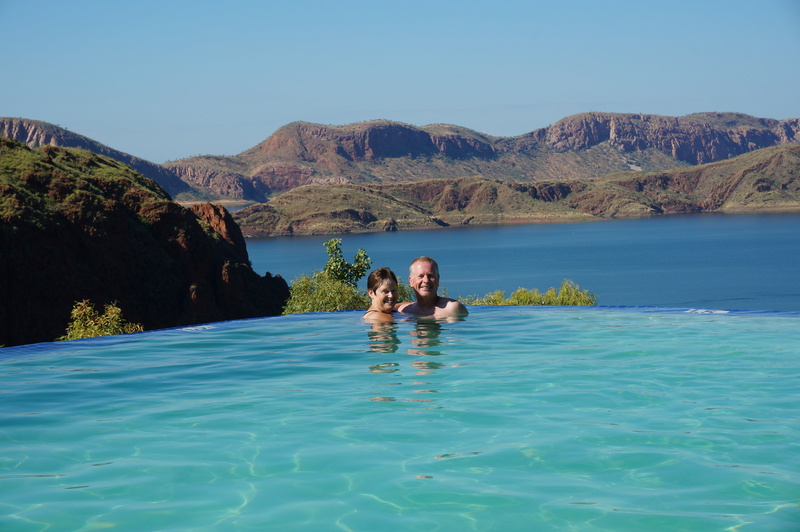 We loved Lake Argyle! Safe travels on the Gibb! Can’t wait to hear what you get up to!! !